In mid-2018 a strange-looking critter was shot and killed in Central Montana. Armchair monster hunters rushed to opine as to its true nature: possibly a jackal, wolf/dog, coydog, coyote, German Shepherd hybrid, Scottish Deerhound, or even a surviving dire wolf (that became extinct over 10,000 years ago) or a “dogman” (a supposed upright-walking cryptid, at least one of which was reportedly sighted in Montana) (Wootson 2018; Murray 2018). A wolf? Experts suggest its front paws were too small, claws too long, ears too big, and coat all wrong—not to mention its canine teeth being too short. Montana Fish, Wildlife and Parks information manager Bruce Auchly admitted, “We have no idea what this is” (Wootson 2018). 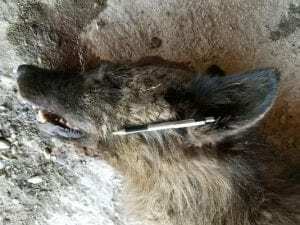 Tissue samples for DNA testing of the “wolflike creature” were taken by officials of Montana Fish, Wildlife and Parks, and sent to the U.S. Fish and Wildlife Service’s forensic laboratory (located in Ashland, Oregon). The animal’s genetic markers were established and then compared with the lab’s reference collection, consisting of thousands of samples taken from other canids including wolves, dogs, and coyotes. The results were clear (Puckett 2018). The animal’s DNA proved to match that of Canis lupus—that is, a gray wolf, one from the northern Rocky Mountains. Although no wolf packs have been established in central Montana, it is not unusual for an animal to be found outside its normal range. That is how ranges come to expand. In fact, wolves have previously arrived in central Montana, coming from the population in Yellowstone National Park to the south. The unusual features of the “mysterious” animal were attributed largely to its being a young individual and, in fact a female (a non-lactating one, meaning that she was without a litter of pups). Besides, according to Fish and Wildlife Service geneticist Mary Curtis, animals can vary considerably in their individual physical characteristics (Puckett 2018). The scientific evidence, therefore, vanquished any thoughts of a monster. The creature proved to be nothing more than a young, female gray wolf, 2 to 3 years old, measuring (from nose to rump) 45 inches and weighing 84.5 pounds (Puckett 2018). Also known as a “Timber Wolf,” Canis lupis shows great variation in its color, which ranges from white to black (Whitaker 2004), and in this instance was described as “dark brown.” Monster enthusiasts should please note the significance of having an actual specimen for analysis. Murrary, David. 2018. Wolf/dog shooting in Montana draws international attention. Great Falls Tribune, June 4 and 5. Puckett, Karl. 2018. DNA tests back on the mysterious animal shot in Montana. Online at https://www.greatfallstribune.com/story/news/2018/06/18/canine-creature-shot-montana-gray-wolf-dna-tests-show/710365002/. Accessed August 9, 2018. Whitaker, John O., Jr. 2004. National Audubon Society Field Guide to North American Mammals. New York: Alfred A. Knopf, 682, 687–691. Wootson, Cleve R., Jr. 2018. Wolflike Creature. . . . Buffalo News, May 26.